She is an award- winning actress with more than forty-five films to her name. But these days she spends most of her time far from Hollywood, instead traveling to conflict and disaster zones. She was named by "Time Magazine" in 2008 as one of the most influential people in the world – clout that Mia Farrow hopes will help bring peace to Darfur. Indeed, the actress – who was once married to Frank Sinatra – has long been a leading lady. She's starred in films including "Rosemary's Baby" and "The Great Gatsby", though she is best known for the 13 movies she made with her former muse Woody Allen. But since 2000, Mia has dedicated herself to her role as a UNICEF Ambassador, traveling to trouble spots that include Sudan, the Democratic Republic of Congo, Chad and Haiti. Her focus is to raise money and awareness for the women and children affected by the violence. She has just returned from her latest trip to Sudan's conflict-ravaged south. 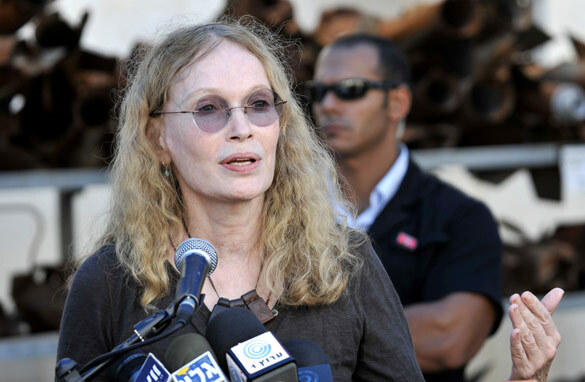 Here's your chance to have your questions answered by Mia Farrow. Hope we can break bread together again some day! Where is Tisa now? Do you have an email address for her. I wanted to write her when Jason died but could not find her and Terry died shortly after. Lots of love always. refugee and alien families here in DR. We are not sponsored by any organization, nor do we seek such. But our question is this: From your experience, what specific familial violence do you think these families need help with? Is there a common thread of particular violence you have encountered? In your opinion, what is at the root? I wish I had kind words for Mia Farrow but I do not. There is no question that Woody Allen's behavior was inappropriate, but Mia's response was disproportionate. She leveled an ugly and unproven allegation against him that has tarnished his reputation and she has never seen fit to apologize. This is not the work of a kind woman, so I am rather suspect of all of her "kindness" towards disadvantaged people. Thank you for your inspiring work on Dafur and other conflict issues. ?When I try to raise awareness of this issue, I get the "take care of America first" agrument. How do you counter the opinion that we don't have the resources any more to help these situations? I seem to remember the 1970s the group 'the Children of God' claimed you had believed as a result of them. What is the truth? Tell us how we can all help. I'd like to ask her if she ever experienced 'the casting couch' scenario in her early days? Thank you for your tireless efforts for the people of Sudan. Could you please use your name and your voice to bring more attention to and condemnation of the western world's hypocrisy and double standard,at least in its rhetoric, regarding Libya and Sudan? Why is it unacceptable for the Libyan government to kill civilians while it is tolerated in Sudan for over 20 years? Because the availability (or not) of Sudan's oil does not affect the world economy? We are so exciting that you are acting again and can't wait to see you in Todd Solondz' DARK HORSE. When will it be on screens? I work for a small non profit group working to raise awareness of genocides and atrocities happening around the world. We facilitate educational and hands on art making workshops that educate all ages about what's happening in Sudan, Darfur, the Congo and Burma, and we raise funds for anti-genocide groups who provide direct services and lobbying. We are making handmade clay bones with our participants and are working towards making 1,000,000 which we will use for an installation on the National Mall in Washington D.C. in 2013. We'd love to have you visit and make bones with us, and hear more about your work. I have the same question as Martina. –	How will you as a UNICEF Ambassador Improve our world, especially Improve Libya? I am awaiting Mia Farrow’s replies. Are you aware of a young Danish artist named Nadia Plesner, who through her art has collected medical supplies and aid for Darfur? She started a foundation in 07 with the sale of a t-shirt she called "simple Living". The t-shirt showed a starved naked african boy, holding a fashionable dog in one arm and a Louis Vuitton carricature designer bag in the other. Sales went well and Nadia Plesner, were able to send quit a few containers off to Darfur. Then Louis Vuitton got wind of the image, they felt Nadia Plesner broke their copyright and proceeded to sue her. This went on for a while as miss plesner, didn´t feel she had done so as the bag merely represents, what we get shown in the news..! She finally had to yield as she was and still is an artstudent. In Copenhagen, Denmark earlier this year (Jan) she opned an exibition in The Odd Fellow Palace, named "It´s time for intervention and you are all invited"
The main piece of the exibiton was a painting inspired by Picassos "Guernica" to the point of having the exact measurement. The centre of this painting features the little african boy, "styled" as in the t-shirts! Now miss Plesner was informed by her lawyers that if she was to use the image in a painting that it would be considred art. Louis Vuitton does not agree and filed a suit , once again against miss Plesner, in the Haag, Holland ( miss Plesner, lives and studies in Amsterdam, Holland. ) while she was still in Copenhagen. At this point her fines have reached close to € 250.000..! The 30th of this month miss Plesner will have her day in court as she has filed a counter suit. The press has covered the story well in northern Europe, but not so (if at all ) in the US, I find this very sad as her initial reason for her artwork is to aid others in dire need, I am sure you know what the conditions are in DARFUR.